He could build fires, fight fires, survive in the wilderness, save a life at the scene of a car wreck, and rescue you from a capsized canoe. He could also bake a mean Christmas cookie and design a remarkably complicated family Easter egg hunt. But when my brother died by suicide we, however, were not prepared. No matter how many years go by, how many seasons change, or how many birthdays pass, it still feels like yesterday he was here, and today, he isn’t. Learning to grow in and understand the world after we lost him poses a new challenge daily. People were right—life does go on. It just doesn’t go on exactly as you thought it would. The questions with once reflexive answers suddenly become intensely analytical. “How many sibling do you have?” or “Who is that in these photos?” catch you by surprise. Many survivors of suicide are still hesitant to be storytellers—I know I am. It’s hard to find words strong enough to overcome the weight of the stigma and the loss and the shock. The weight is so heavy. For a long time, it didn’t feel like there was a space where I could ask questions. About this kind of loss. About mental illness. About healing. It felt like there was never a moment to step back. But I’ve learned that it’s not a matter of waiting for the “right” time, it’s a matter of making the time. The time to talk and grieve and feel and check in with ourselves. The time to feel what we are feeling even if it is heavy and uncomfortable and disappointing. The time to share openly and intimately, and to listen and ask the scary questions that may breed even scarier answers. I am learning that those answers help us grow. Those answers—the raw, honest, crowded, complicated, painful answers help build the foundation for a community with space for storytelling. Storytelling that isn’t perfect. Storytelling that involves nonlinear recoveries and nontraditional life paths. When we accept that defeat and imperfection are part of life, we open ourselves up to the possibility of becoming the greatest storytellers. We open ourselves up to the chance of carrying on lives that we have loved and the lives we may have lost. When the grief subsides, life emerges. Heavy and overwhelming shift to make room for the healing. 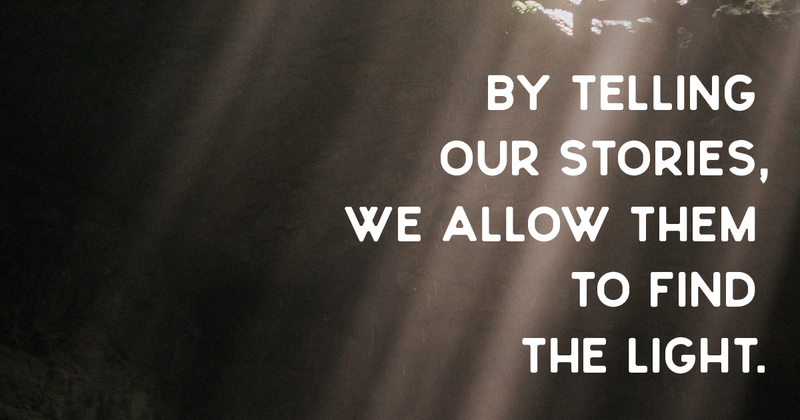 By telling our stories, we allow them to find the light, to find other people and other storytellers. Suicide took the power of storytelling from my brother. It’s because of a few beautiful, patient, understanding, courageous people who continue to build windows where I put up walls, that I am still telling my story. And I’m telling his, too. An Eagle is a symbol of hope and resilience and strength. He lived his life to embody all of those things; the Eagle Scout Honor was just a confirmation of something we already knew. Wow, this brought chills and a lot of tears to my eyes. My brother committed suicide almost 3 months ago now, on his 33rd birthday. He was an Eagle Scout as well. Your words are so beautiful and so true! So thank you, I really needed to see this. We are heartbroken to hear about the loss of your brother, and we mourn his loss with you. We are glad that we were able to give you support through this blog post. We hope you continue to find words of comfort everyday. Please know that if you would like someone to talk to, you are welcome to email us at info@twloha.com. You are welcome to share your story with us. We are here for you. Thank you for sharing. My sister died by suicide this past September. She was a daughter, mother, sister, aunt, cousin and friend to many. She was athletic, talented, funny,smart and strikingly beautiful. She was the keeper of my childhood, my glass animal fort building playmate. She excelled in all endeavors and I idolized her growing up. Later in life she married into a toxic relationship and she struggled with alcoholism and depression. It was and is so hard to see someone so capable and loved struggle so. Her suicide and death has gutted our family. We are incredibly sorry to hear about your loss and your sister’s passing. Please know that our entire team is thinking of you. Would you reach out to us at info@twloha.com? We would be honored to offer you some support and encouragement throughout this difficult time. I didn’t realize how many people were in my corner until I actually let them into my corner.